What is an expansion device? There are 2 places in a refrigeration system that change the pressure. One is the compressor which creates an increased pressure on the high side and the other is the expansion device which restricts flow to the low side. Here we will discuss the restrictor that controls refrigerant flow to the evaporator. The red circle on the diagram below is the expansion device. Without this part, the compressor would simply pump refrigerant throughout the system and there would be no appreciable change in pressure between the high side and the low side. When the flow is restricted, several things happen. The gas that was pumped into the condenser is restricted and its pressure is increased. As the pressure increases, the condensing temperature increases. When the condensing temperature reaches 20 to 30 degreesF above the ambient temperature, the gas condenses into a liquid and gives up heat. Because liquid takes up less space than gas, it can pass through the expansion device into the evaporator. Once the liquid has passed through the device, the pressure is much lower due to the compressor pulling refrigerant out of the evaporator. Now the pressure is lower so the evaporating temperature is lower. The refrigerant then boils at the lower temperature, absorbing heat. So it can be seen that the expansion device is very important to how the system performs. 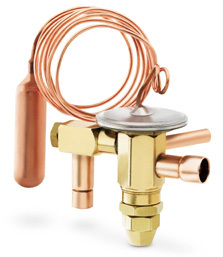 Below is a slide show covering expansion valve types and design. Below we look inside a TXV to see what parts it contains. The fixed orifice device is simply a restriction in the liquid line placed before the evaporator. It does its job by not allowing all the liquid refrigerant to pass thru. This creates a pressure difference between the high side and the low side of the system. The amount of refrigerant that passes thru is limited by the pressure difference between high side and low side. If the high side pressure increases, and the low side pressure stays the same, the flow increases. If the low side pressure increases and the high side stays the same, the flow decreases. It is the pressure difference that makes this control work. We will be discussing this design and what makes it work. The video below shows what the fixed orifice looks like and how it works.